​​Management of Workplace Stress - Something New Everyday! Workplace stress occurs when there is a mismatch between the demands of the job and the resources and capabilities of the individual employee to meet those demands. It is the adverse reaction which the employees have to excessive pressures or other types of demand placed on them. There is a clear distinction between pressure, which can create a 'buzz' and be a motivating factor, and workplace stress, which can occur when this pressure becomes excessive. Workplace stress is a matter of great concern. Excessive stress can interfere with the employee's productivity and impact the physical and emotional health and the ability of the employee to deal with it. It can mean the difference between success and failure. Stress has been defined in different ways over the years. Originally, it was conceived of as pressure from the environment, then as strain within the person. Stress is defined as "the adverse reaction people have to excessive pressures or other types of demand placed on them". The generally accepted definition today is one of interaction between the situation and the individual. It is the psychological and physical state that results when the resources of the individual are not sufficient to cope with the demands and pressures of the situation. Thus, stress is more likely in some situations than others and in some individuals than others. Stress can undermine the achievement of goals, both for the individual employee and for the organization. Earlier the typical response from the management to workplace stress used to be blaming the victim of the stress, rather than its cause. But presently the situation is changing and it is now being recognised that the management has a duty, in many cases enforced by the statutory authorities, to ensure that employees do not become ill due to workplace stress. It is also in the long term economic interests of the organization to prevent workplace stress. Good employment practice includes assessing the risk of the workplace stress amongst employees. This involves the following. 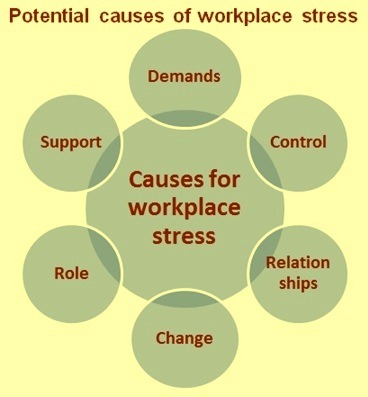 There are six kinds of substantive factors which are identified as potential causes of the workplace stress (Fig 1). These are (i) demands made on employees, (ii) the level of control employees have over their work, (iii) the nature of relationships at work, (iv) the way by which the change is managed, (v) the clarity of the employees' role within the organization, and (vi) the support employees receive from the management and their colleagues. Workplace stress is the response employees may have when presented with work demands and pressures that are not matched to their knowledge and abilities and which eventually challenge their ability to cope. Excessive and otherwise unmanageable demands and pressures can be caused by poor work design, poor management and unsatisfactory working conditions. Similarly, these things can result in employees not receiving sufficient support from others or not having enough control over their work and its pressures. The degree of workplace stress experienced by an employee depends on the functioning of the following two protective physiological mechanisms. Alarm reaction – When confronted with a threat to the safety, the first response of the employee is physiological arousal. This results into the muscles becoming tense and increase in the breathing and heart rate. This serves well when the threat is the proverbial bull in the field rushing towards the employee. The employee either fights or flees. Present day threats tend to be more psychological (e.g. unjustified verbal attack by a superior at work). It is usually not socially acceptable to act by 'fight or flight', and an alternative means of expressing the resultant emotional and physical energy is required. This falls in the arena of assertive communication. Adaptation – The second adaptive mechanism allows the employees to cease responding when they learn that stimuli in the environment are no longer a threat to their safety. For example when employees of blast furnace first face the flowing hot metal and slag in the cast house, the response to the molten liquid flowing past is to get alarmed, as described above. Over time, the employees' response dwindles. If this process does not function, then the employees would eventually collapse from physical wear and tear, and mental exhaustion. Workplace stress is experienced when either of the above two mechanisms are not functioning properly or when the employees find it difficult to switch appropriately from one to another. This forms the basis of individual approaches to stress management. It is the perception, or appraisal, of the situation which is the key to whether or not it causes stress. This is the basis of the transactional model of stress, whereby the ability of an employee to prevent or reduce workplace stress is determined by that employee's appraisal of (i) the threat within a situation (primary appraisal), and (ii) the appraisal of the employee's coping skills to deal with that threat (secondary appraisal). These appraisals have been shaped by past experiences of confronting stress and, in turn, influence future behaviour and appraisals. Thus, the process of appraisal, behaviour, and stress is continuous, and managing stress can result from changing the way the situation is appraised (cognitive techniques) or responded to (behavioural or cognitive techniques). Workplace stress takes many forms. As well as leading to anxiety and depression, it can have a significant impact on an employees' physical health. Signs of workplace stress can be seen in the employees' behaviour, especially in changes in their behaviour. Acute responses to stress may be in the areas of feelings (e.g. anxiety, depression, irritation, and fatigue), behaviour (e.g. being withdrawn, aggressive, tearful, and unmotivated), thinking (e.g. difficulties in concentration and problem solving), or physical symptoms (e.g. palpitations, nausea, and headache). If stress persists, there are changes in neuroendocrine, cardiovascular, autonomic and immunological functioning, leading to mental and physical ill health (e.g. anxiety, depression, or heart disease). The workplace is an important source of both demands and pressures causing stress, and structural and social resources to counteract stress. The workplace factors that have been found to be associated with stress and health risks can be categorized as those to do with the content of work and those to do with the social and organizational context of work. Those that are intrinsic to the job include long hours, work overload, time pressure, difficult or complex tasks, lack of breaks, lack of variety, and poor physical work conditions (e.g. space, temperature, light). Unclear work or conflicting roles and boundaries can cause workplace stress, as can having responsibility for the employees. The possibilities for job development are important buffers against current stress, with under promotion, lack of training, and job insecurity being stressful. There are two other sources of stress, or buffers against stress. These are (i) relationships at work, and (ii) the organizational culture. Management which is critical, demanding, unsupportive or bullying type creates stress, whereas a positive social dimension of work and good team working reduces it. An organizational culture having top level controls can cause workplace stress. On the other hand, a culture of involving employees in decision making, keeping them informed about what is happening in the organization, and providing good amenities and recreation facilities reduce stress. Organizational change, especially when consultation has been inadequate, is a huge source of workplace stress. Such changes include mergers, relocation, restructuring or downsizing, individual contracts, and redundancies within the organization. Situations which are likely to cause workplace stress are those which are unpredictable or uncontrollable, uncertain, ambiguous or unfamiliar, or involving conflict, loss or performance expectations. Workplace stress may be caused by time limited events, such as the pressures of inspections or work deadlines, or by ongoing situations, such as family demands, job insecurity, or long commuting journeys. A systematic review of the evidence for work factors associated with psychological ill health and associated absenteeism has found the key factors for the workplace stress. These factors are follows. Long hours of work, work overload and pressure and their effect on the personal lives of the employees. Resources that help to meet the pressures and demands faced at work include personal characteristics such as coping skills (e.g. problem solving, assertiveness, time management) and the work situation (such as a good working environment and support from the management and colleagues). These resources can be increased by investment in work infrastructure, training, good management and employment practices, and the way that work is organized. High levels of stress in the workplace can lead to the following. Workplace stress has adverse effects for the organizations in terms of the following issues. It is also worth thinking about the impact that workplace stress can have on a unit or a team in the organization. For example, losing one colleague for an extended period with a stress-related illness can have a dramatic impact on the workload and morale of the rest of the team. Presenteeism is the term used to describe the opposite of absenteeism. It is the phenomenon of employees coming to work yet not functioning up to their capabilities on the job. Presenteeism manifests in a host of ways, including making mistakes, more time spent on tasks, poor quality work, impaired social functioning, burnout, anger, resentment, low morale and other detrimental factors. If the stress underlying presenteeism is not addressed, then absenteeism, job resignations, chronic illness, and disability may be the result. A variety of strategies may be used to prevent workplace stress problems. These strategies can be categorized as (i) primary, (ii) secondary, and (iii) tertiary. Strategies at the primary level directly address the causes of workplace stress. They aim to eradicate or reduce the causes of stress within the organization in order to lessen its negative effects on the health of the employees. Secondary and tertiary strategies mainly deal with the consequences rather than the causes of workplace stress. Secondary prevention acts on personal factors and helps employees adapt better to their work environment, while tertiary prevention aims to reduce the suffering of the employees who have a workplace stress related health problem. Strategies at the primary level deals with the causes or sources of stress which are present within the organization in order to reduce or eliminate them completely. The aim is to reduce the possibility of developing health problems by reducing employees' exposure to the risks in their work environment. For example, this type of strategy reduces work overload, improves communication or increase participation of the employees in the decision making processes within the organization. Secondary prevention strategies are those which deal with the personal characteristics and mechanisms of individual employees. The idea is to give these individual employees the tools needed to deal more effectively with stress. These strategies do not address the causes of the workplace stress, but aim to reduce the effects of stress on the individual. For example, these strategies could involve teaching individual employees how to better manage their stress and time or to make better lifestyle choices. Tertiary prevention strategies come into play at the point when the individual employees are experiencing workplace related health problems. This level of prevention influences the consequences of exposure to stress. Tertiary prevention strategies result in a reduction of the individual employees' suffering and an improvement in his health. This may include consultations with a psychologist to obtain support and active listening or a policy to allow an individual who is on leave due to a workplace health problem to gradually return to work. Training of the employees helps prevent workplace stress because of the following. The prevention and management of workplace stress requires organizational level interventions, because it is the organization that creates the stress. An approach which is limited to helping those already experiencing stress is analogous to administering sticking plaster on wounds, rather than dealing with the causes of the damage. An alternative analogy is trying to run up an escalator that's going down! Organizational interventions can be of many types, ranging from structural (e.g. staffing levels, work schedules, physical environment) to psychological (e.g. social support, control over work, participation). The emphasis on the organization, rather than the individual, being the problem is well illustrated by the principles used in Scandinavia (given below), where there is an excellent record of creating healthy and safe working environments. The following are the principles of preventing stress in workplace. Assessing the risk of stress within the workplace must take into account the following. The number of employees exposed to the hazard. The analysis of stressful hazards at work must consider all aspects of its design and management, and its social and organizational context. Although the priority is prevention, protective measures can be introduced to control the risk and reduce the effects of a given hazard. The relationship between employees and management improves and many issues can be sorted out at workplace with mutual understanding.